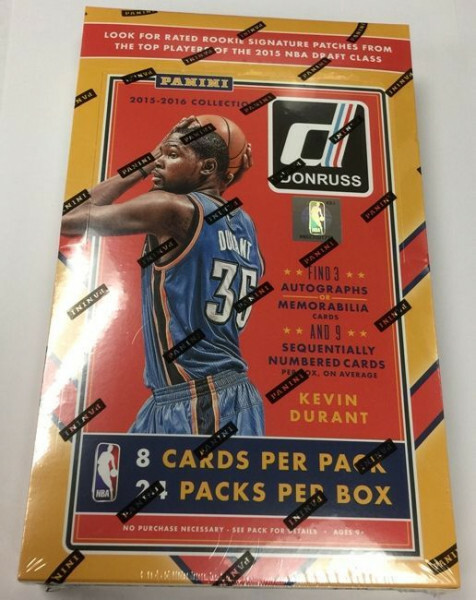 Produktinformationen "2015/16 Panini Donruss Basketball Hobby Box NBA"
Donruss is back and is tailored toward collectors of all ages! Donruss features a 250-card base set, consisting of 200 veterans and 50 rookies showcasing the iconic Rated Rookie card that has come to define the Donruss brand. Collect Rated Rookie Signature Patches from the stars of the 2015 NBA Draft Class. Look for at least 9 sequentially numbered cards per box, including new parallels that highlight player's points, rebounds, and assists per game. Pull rare Elite Dominator Signatures with autographs from the NBA's top rookies, veterans and legends, sequentially numbered to 49. Weiterführende Links zu "2015/16 Panini Donruss Basketball Hobby Box NBA"
Fanbewertungen für "2015/16 Panini Donruss Basketball Hobby Box NBA"